The students of Sifton Elementary School Choir accompany soul singer AV on an empowering and gritty, inner-city soul anthem. This song was recorded June 4, 2018, with students from the Sifton Elementary School Choir. Sifton Elementary is a school in North Edmonton where many students come from war-torn countries and traumatizing an/or impoverished situations. 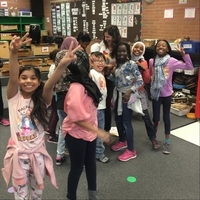 The funding of this recording was made possible via an anonymous donor who saw the students and AV perform at a school fundraiser May 4, 2018-- a song which AV was commissioned to write for the occasion. The donor was so moved and inspired by the performance that he immediately asked how the song could be immortalized by a studio recording of it, and a week later graciously provided the funding for this endeavor. A month to the day after their debut performance the students, AV, AV's producer and videographer Tino Zolfo were in the recording studio recording the song and making a music video for it. None of the students had been in a recording studio prior to this date, but have inspired many people with their talent, hope, and enthusiasm. Thank you for listening and being part of this experience. Ann Vriend is known most for her soaring, evocative, Aretha-eque vocals, and not far behind that for her abilities as a songwriter, both lyrically and melodically. Plus she ain’t too bad at the piano, either. With a compelling combination of defiant resilience and heartfelt vulnerability she delivers her unique brand of gritty, inner-city soul-- and sometimes quite the funky old-school dance party. Coming from a humble background on Edmonton’s east side, and for the past decade calling Edmonton’s troubled and somewhat notorious inner city neighborhood of McCauley home Vriend does not shy away from difficult social issues. Instead, she contributes her own Canadian brand of RnB in the rich tradition of soul artists who have delivered stunning recordings and performances that are both contagiously fun AND socially thought provoking, while never preachy or simplistic, such as Curtis Mayfield, Ray Charles, Sly Stone, Marvin Gaye, Aretha Franklin, and all the way up the line to Janelle Monae and Beyoncé. Often compared to her vocal hero, Aretha Franklin, Ann Vriend also kills it live, having sold 18,000 albums off the stage independently. A consistently critically acclaimed artist she is also known for assembling a live band that is the admiration of all "musician's musicians," and is an award-winning performer AND songwriter, having won the “She’s The One” performance contest at the Ottawa Bluesfest, as well as the 2017 Cobalt Music Prize at the Maple Blues Awards for her gospel style ballad “All That I Can,” to name a few accolades. Equally comfortable and inspiring in a “shut-up-and-listen” solo/duo rooms as she is with a full, heavy funk band Ann Vriend has recently split her performances and recordings into 2 projects: 1 being “Ann Vriend;” the solo/duo acoustic soul, blues, and roots performer, and the other being “AV;” a louder, dancier presentation, focused on heavy rhythm section grooves, and full RnB production. Between the 2 projects Vriend’s early 2018 schedule includes tours of Japan, Australia, continental Europe, and Canada. She will have new recordings released under both projects throughout the 2018 calendar year.